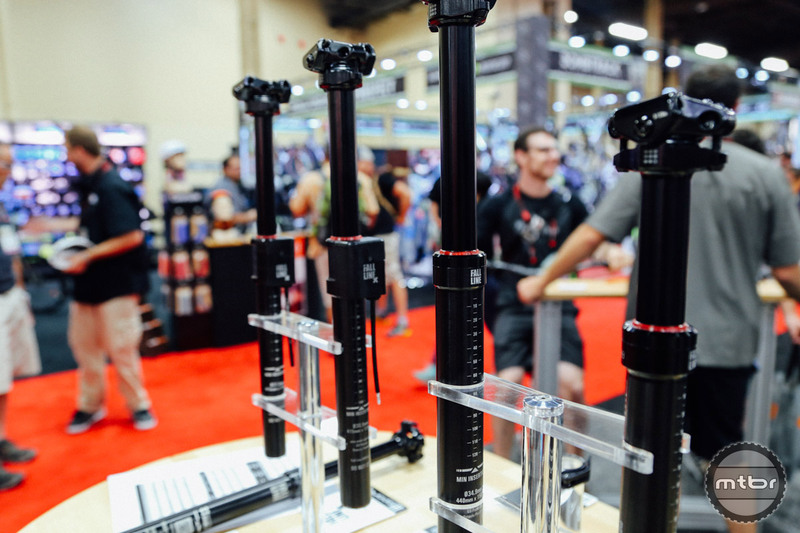 Tall riders rejoice — a 200mm dropper post is here. Last year 9point8 teased two extra long droppers, 175mm and 200mm models. At the time, those were almost unheard of and the Canadian brand was unsure of demand. There are now a few brands with offerings in the 170mm range, so 9point8 has now gone into production with both the 175 and 200mm models. At Interbike, they were also showing two new prototypes. The first was a 34.9mm version of their existing post for bikes such as the Evil Wreckoning and new Specialized Enduro. This post will be available in every length drop (including 200mm), as well as custom lengths in between. 9Point8 is close to releasing an externally routed version of their post. It uses a similar mechanism as their regular Fall Line, except the internals are housed in a small box on the exterior of the post. While it may not be the most aesthetically pleasing, it does make a 27.2 version possible. 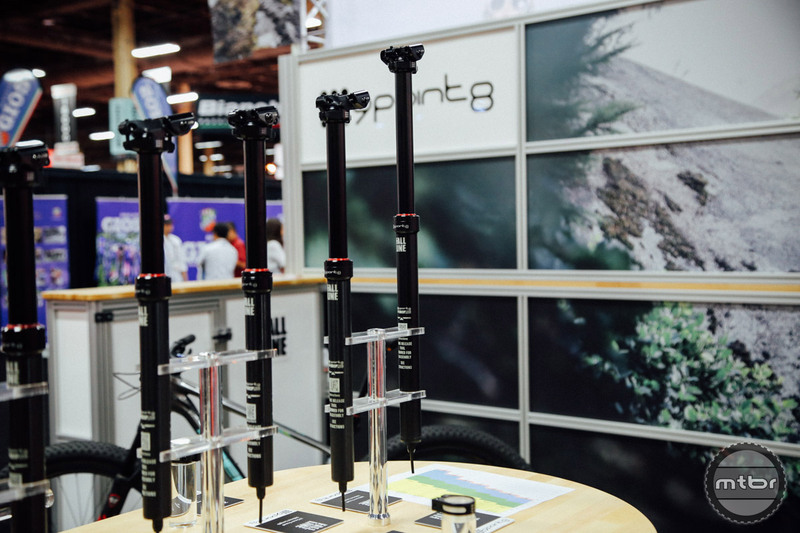 9Point8 is also developing an externally routed version of the popular Fall Line post which is compatible with older frames and allows them to make a reliable 27.2 version. That’s exciting news for anyone with a cross bike or older hardtail. To learn more, visit www.9point8.ca. Rohloff’s internally geared hubs are expensive, but the legendary reliability makes them ideal for adventuring into remote places. In the world of internally geared hubs, Rohloff is king. Their products are not cheap, but they’re bulletproof. As a result, they’re often the drivetrain of choice for riders setting off on around the world adventures. The one issue that some customers had with the hubs is that the threaded sprockets were difficult to remove in remote locations. To make things easier, the German manufacturer has launched a new splined version that uses a snap ring to hold the sprocket in place. 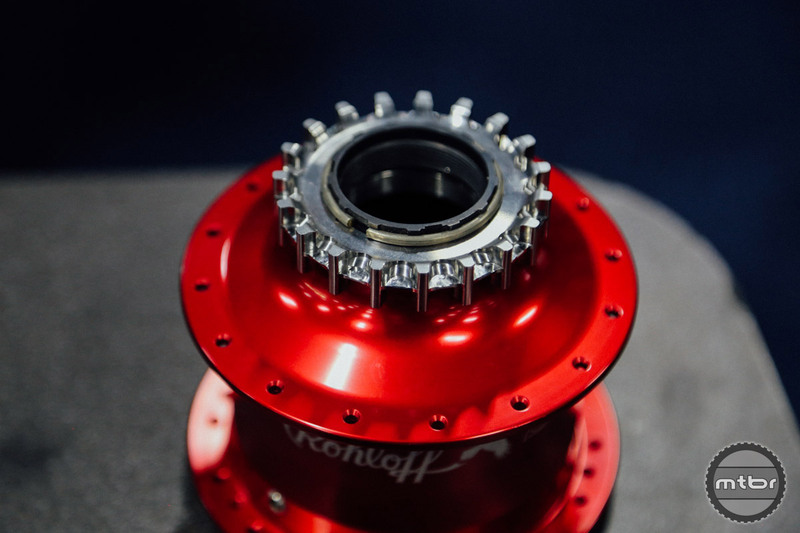 The carbon belt drive hub will also use the new sprocket system, but the belt line will remain the same. The new carrier still threads on, so it’s retrofittable onto older hubs. The one caveat is the new system pushes the chain line out by 3mm, so it may cause clearance issues on bikes where the chain goes through the frame or with certain chain cases. Rohloff has more details on their website. 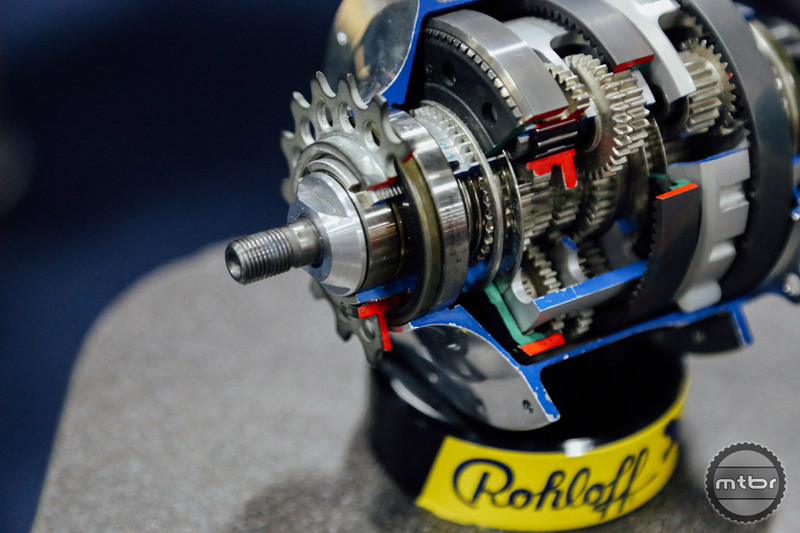 The Rohloff sprockets are designed to work best with derailleur chains. While single speeds are strong and cheap, they’re don’t last as long. The sprockets are available in sizes 13-19 and 21. The smallest will retail for $53 and prices go up incrementally from there. 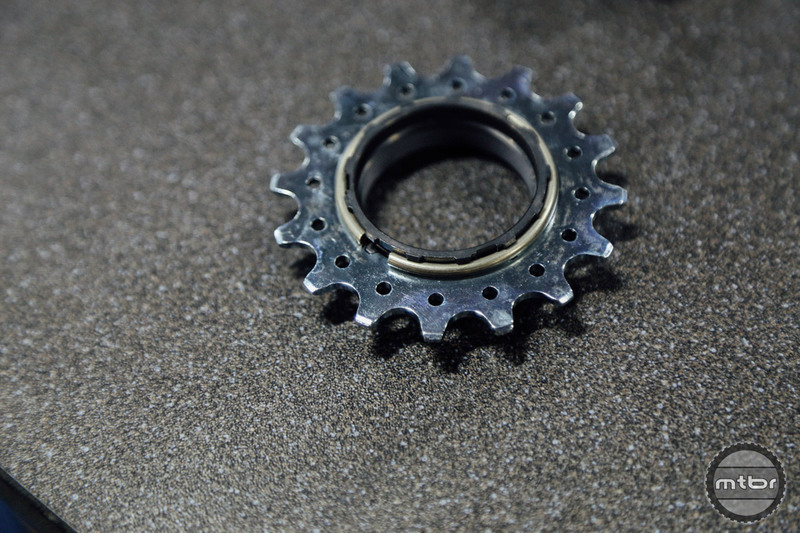 Upgrading an existing hub to the new system will initially be more expensive than simply buying a threaded sprocket, but cheaper in the long run due to the lower prices on the new sprockets. To learn more, visit www.rohloff.de. Modern suspension forks use very little suspension fluid, so this 16oz serving should last most mechanics a few seasons. 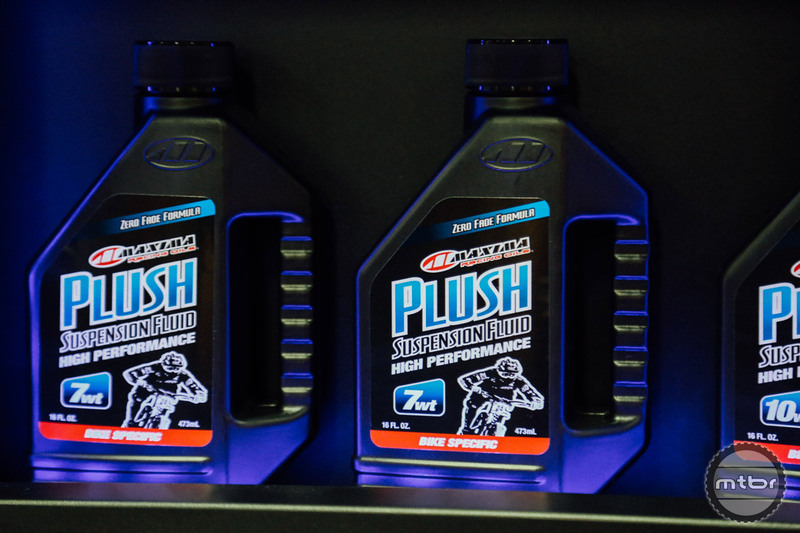 Maxima was showcasing a new suspension fluid specifically designed for MTB usage. 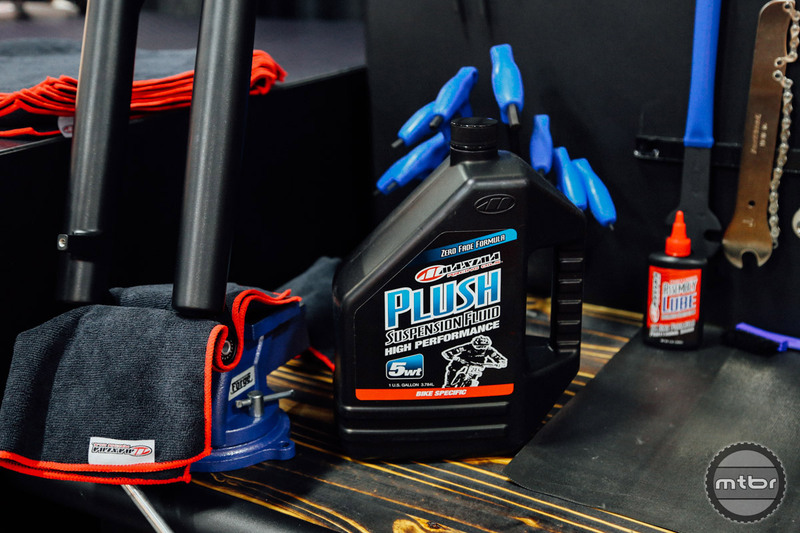 Their previous products were designed for power sports, which have different needs. If you’re still running an older fork with an open bath system, you might want to check out the gallon sized offerings. The fluid is designed for use in both forks and shocks is available by the pint for $13. A gallon of the stuff retails for $90. It comes in 3,5,7 and 10 weight. To learn more, visit www.maximausa.com. Tall people rejoice. A 200mm post is here. Modern suspension forks use very little suspension fluid, so the 16 oz version should last most mechanics a few seasons. There are a “few” 27.2 fullies around !